Oh Hi!! Have you missed me much? Lol Maybe not I guess. 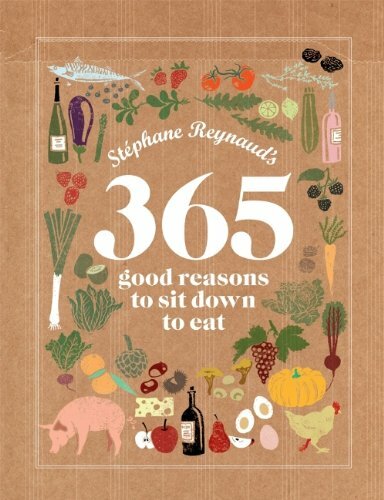 There will be a series of posts from Stephane Reynaud’s 365 Good Reasons to Sit Down to Eat Challenge. It’s a sweet challenge set by Murdoch Books, where a team of home cooks / bloggers / anyone completes the challenge of cooking all of Stephane Reynaud’s dishes in his book here . (The one I’ve just won 😉 tee hee hee) You can check out the 365 challenge team and their blog posts, if you’re interested to join, shoot them an email and they’ll get in touch with you. Just before I get started here’s a little questionnaire. Position : An executive somewhere in Kuala Lumpur. How did I get here: I saw it first on Ellie’s post! (The one with bacon mayonaise ;P) It was rather interesting as I’ve always wanted to do a challenge like this, but as with my failed Project 52 Ice Cream Mondays, I dare not put myself up for a year long challenge especially when I know I’ll be moving some time soon. So this challenge came at the right time where it’s a team challenge, so I make however much dishes I want from the challenge. If I were to rate my cooking abilities from 1-10, I would say 6. I can cook, but I don’t cook much. But I bake darn lots! If I were to rate my baking abilities, then 8.5 . Lol. Where’s the sauce!! Lol. Sauce Poulette was originally made from the cooking broth of a poule au pot. and this stock is used to be the basis of a creamy bechamel sauce. Indeed. But because I had not enough of white wine (which I thought I had) and cream to make ’em mussels swimming in a pool of creamy white sauce. It is actually quite easy, all you need is 10 minutes of cooking time. Actually even lesser cause the mussels were already 1/2 opened and I made enough fr 2 servings. One for me for dinner, one for me (again) when I bring lunch to the office the next day. 2. Heat pan with butter and a tad of olive oil, add in shallots and garlic. Stir. 3. Add white wine and let it reduce for 1-2 minutes. Add in mussels and toss toss toss. 4. Add cream and stir again. Close the lid for 5 minutes, stirring every now and then. 5. If using, mix corn flour with a little water and add into the mussels. Stir and let it cook for another 5 minutes. Otherwise if mussels are done, remove from heat and serve. If using closed shell mussels, they will open up when they’re cooked. 6. Scatter with chopped parsley and stir hot!. And that’s one of the reasons why I chose to work with this recipe. Fast, easy and simple. The only time I’ve cooked with mussels is either scatter with cheese and bake them, remove the meat from the shell and make risotto, and that’s it. Mussels are really a turn off if it’s over cooked, so I don’t eat much of them out too. But this was so easy I’m going to go get another bottle of white wine and some cream to finish up the rest of the mussels. If you wish to join in the challenge, you can contact Murdoch Books, meetus@murdochbooks.com.au with ‘365’ in the subject line and they’ll get in touch with you. It’s not everyday that I stumble a fellow pastry cook n cookbook junkie n golden retriever lover. Hahaha. Hey the mussel recipe is a definite classic for a 365 daily food challenge. Fresh mussels, of course! Very Nice Creation you got!